Anna Choutova is pointing to ‘The Holy Fountain’, her own contribution to the show she curated entitled Let Them Eat Fake. 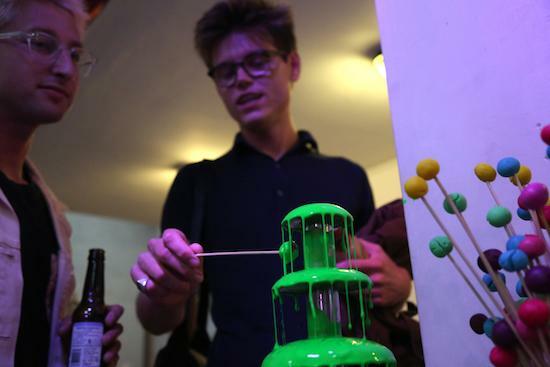 It’s a chocolate fondue fountain spilling forth an endless stream of lime green acrylic paint. 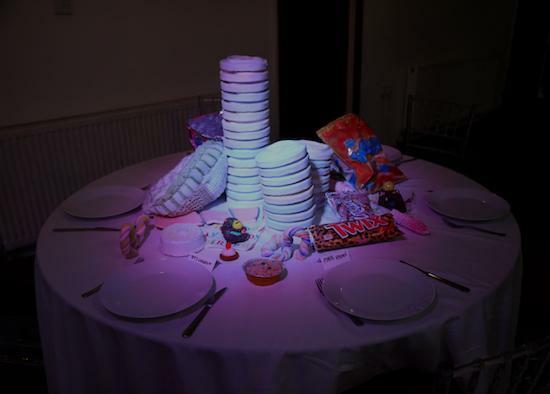 By its side, a pile of skewers bearing playdoh marshmallows sit ready and waiting to be dunked. It is, quite possibly, the least appealing food stuff I have ever seen. “It’s supposed to look as poisonous as possible,” Choutova confirms. The final show includes works from some thirty different artists, from the UK, USA, the Netherlands, Germany, and Georgia. It is an absolute smorgasbord of horror. 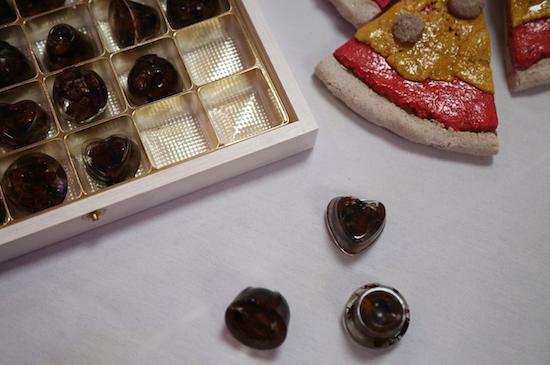 There are boxed praline chocolates that prove, on closer inspection, to be cockroaches cast in resin. Grey sandwiches and lollipops made of coal ash, and resin, like remains from some nuclear holocaust. Red and white nail varnish re-labelled with Heinz ketchup and mayonnaise stickers. The total show looks less like your standard white cube exhibition, more like some kind of nightmare wedding. On the opening night, there were flashing stage lights and a DJ playing disco music. Born in Stockholm, the child of Russian immigrant parents, Choutova moved to London at the age of nine and attended what she refers to as “a kind of art high school run by these old hippie guys” in north-west London. “And then, I really didn’t know what I was doing with my life for a long time.” She ended up studying fine art painting in Brighton. More than anything else, perhaps, Bad Art is about breaking down art world taboos. A previous show, entitled 'Touch Me Baby', discarded the museum stanchions and velvet rope in favour of work that an audience could reach out and touch and grapple with and fondle and interact with. The idea was a response to Choutova's own longing to stroke a particularly luscious oil painting at Kensington Olympia's Art16 fair, but it succeeded in exposing the contradictory, almost fetishistic relationship the art world has to the sense of touch: simultaneously inviting the spectator's caresses and forbidding them. "I want to get in there!" Choutova says. "I hate that separation between the public and art!" Bad Art is a radical overthrow of art's ivory towers, a casting open of the cathedral doors to everyone and every impulse previously abhorred by its dour priestly caste. If it sometimes seems crass, unkempt, and juvenile; then it is crass, unkempt, and juvenile in the same way as punk rock. Above all, it is fun and playful – but like the Situationist International, it uses play in the service of a radical critique.